Silvery white, lustrous, solid metal. Soluble in sulfuric acid, nitric acid, potassium hydroxide and potassium cyanide solution. Insoluble in water. Imparts garlic-like odor to breath, can be depilatory. It is a p-type semiconductor and its conductivity is sensitive to light exposure. (Metal and compounds, as Te): Toxic by inhalation. Tolerance: 0.1 mg/m3 of air. Tellurium could be used in different fields, according to its purity. It could be used as infrared detector materials, solar cell material, cooling material and so on. Mainly applied for compound semi-conductor, solar energy cell, electrothermic transition element, cooling element, air-sensitive, thermosensitive, pressure-sensitive, photosensitive, piezo-electric crystal and nuclear radiation detect, infrared detector and basic material. Business Description: “Wuhan Xinrong New Material Co. Ltd” is a new material company concentrated on providing high-purity metals and high-quality chemical raw materials for high-tech enterprises and research institutes. The company is committed to become a professional " functional fine materials provider." 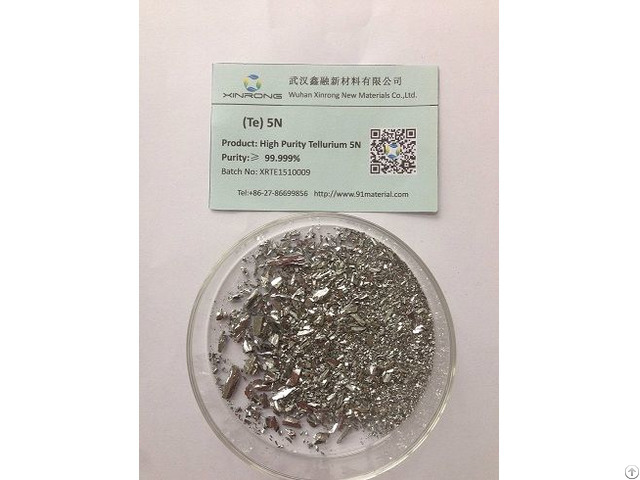 Our company independently develop, manufacturer and sell high-purity metals, compound materials and target materials, including Tellurium (Te), Indium (In), Gallium (Ga), Antimony (Sb), Cadmium (Cd), Selenium (Se), Bismuth (Bi), etc., as well as the relevant compound materials. The purity of these products ranges from 99% to 99.99999%. Furthermore, Our company can also offer customized synthesis of a variety of chemical raw materials to provide customers with a full range of customized services.